Each Sailor had 5 minutes to pitch their idea to improve the Navy, and then answer questions from the panel and audience at large. After each round, the audience and panel voted on each idea based on actionability, presentation, and idea quality by secret ballot. The scores were averaged together and ranked. ET2 Danielle Walters took the prize and earned the “Athena SE 1.0 Admiral Sims Award for Intellectual Courage” for her solution to the Navy’s administrative process to route special requests through the Chain-of-Command. By routing all special requests electronically, vice the current paper method, routing time is reduced, as well as reducing the ‘opportunities’ to reroute lost paper requests. Additionally, ET2 Walters’ proposed solution increases protection of sensitive documents, through a streamlined tracking system. 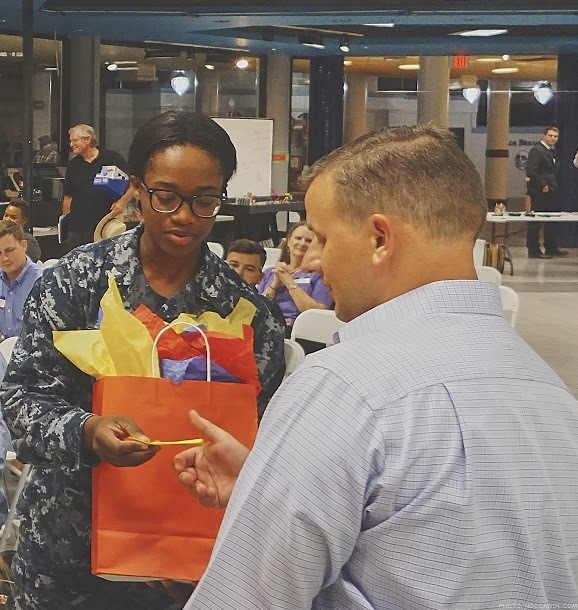 As the 1st place winner, ET2 Walters was awarded a one year membership to CoLabJax and The Bunker, a veteran entrepreneur incubator, who will help her refine and prototype her idea. FC1 Chris Darby came in 2nd place and was awarded a 3-month membership to CoLabJax and The Bunker to refine his idea to solve the conundrum of remembering 15-character passwords by using cognitive passwords attached to emojis. Cognitive passwords go beyond biometric and physical passwords to protect our data. Cognitive passwords are based on personal events and/or opinions that are not only extremely difficult to break, but also memorable to the user. IT2 Brendan Rodgers envisions a more robust catalogue of interesting and educational Professional Military Education (PME) topics on Navy Knowledge Online (NKO) that would award the student with certificates from the Navy War College. Topics would include history, honors and ceremonies, and traditions of the United States Navy. These courses are designed to be interactive, engaging, and help Sailors develop a higher level of respect for their uniforms’ and the United States Navy. These courses will also help strength our Navy, by providing content for Sailors to dig deeper into our history, so they can properly influence the future. FC2 Dean Loverde would like to see a web-based bulletin board for IWO JIMA Sailors to be able to exchange information about items for sale, knowledge to share, lost and found items, and other such community-driven conversation. ET3 Patrick Fisher has a great idea regarding the Navy’s Enlisted Evaluation process. Currently, only supervisors evaluate subordinates, however, ET3 wants to add more data evaluation data points to the process by including the opinions from direct subordinates and supervisors for all members. By including the opinions of subordinates, a more accurate picture is painted, and allows feedback to the supervisor, which will overall improve our Navy’s over all selection of superior leadership. IC2 Robert Moore would like to see his plan to not only recycle the massive amounts of metal waste produced by the Navy, but to see a system that allows flexibility to be able to return the recycling profits returned to MWR. Copper, Aluminum, and brass prices continue to rise, why not just recycle these metals, but collect the cash associated. Understanding there are strict rules governing the military’s constraints on receiving money, IC2 would like these laws to be revisited in order to not only support a greener Navy, but also add to MWR’s coffers. All in all, the first Athena South East event was an excellent collection of bold innovators focused on making the Navy better. With so much energy from the first event, we’re looking forward to keeping the chapter going strong at our next event! Stay tuned! LT Kristen Wheeler is the former Combat Systems Officer onboard the USS IWO JIMA. She’s currently assigned to the Navy Innovation Advisory Council at Moffett Field in San Francisco. 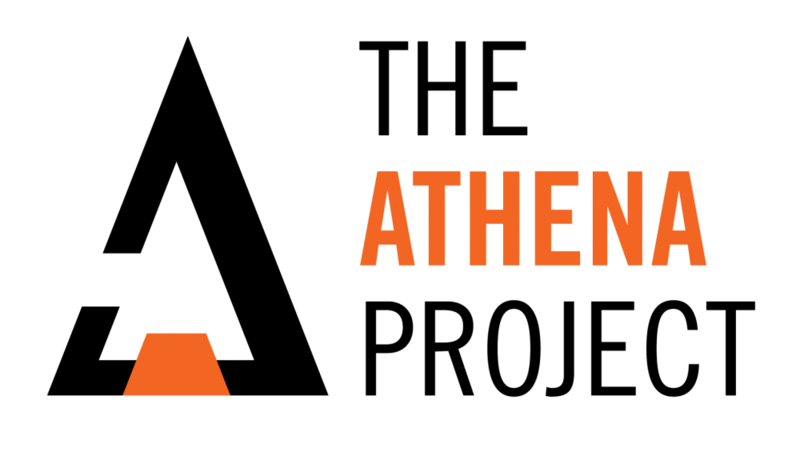 There are loads of Athena Events coming up! If you’re in the San Diego, Groton or Yokosuka areas, connect with us if you want to be a part of our upcoming events! Connect with us on Facebook: www.facebook.com/athenanavy or follow us on Twitter: @AthenaNavy. Interested in starting a movement of your own? Message us, or e-mail athenanavy@gmail.com! USS BENFOLD (DDG 65), the Defense Entrepreneurs Forum, and a team of innovation veterans from fleet concentration areas across the United States have teamed up in Japan to establish ATHENA Far East, our first permanent ATHENA hub outside of the continental United States! Rooting itself at Commander, Fleet Activities Yokosuka (CFAY), Japan, the opportunities to collaborate with Japanese and American sailors are tremendous. The surface and submarine mariner of the Japanese Maritime Self Defense Forces across Yokosuka Bay, an entrepreneurship professor from a local university, the talented civilian maintenance community, an aviation mechanic in Aircraft Carrier RONALD REAGAN…we will reach at every corner of civilian and military entrepreneurship to bring the same diverse conversation under one roof that has made every ATHENA so successful before us! If you are in Japan, make plans now to join us on January 15th from 1245 – 1430 at the Commodore Matthew Perry General Mess “Tatami Room” on the Yokosuka Navy Base. Any Military members or DoD Civilians interested in pitching ideas at this event can reach out on facebook or connect with us on the gmail account listed below! Connect with Athena on Facebook: www.facebook.com/athenanavy or follow us on Twitter: @AthenaNavy. Interested in starting a movement of your own? Message us, or e-mail athenanavy@gmail.com!